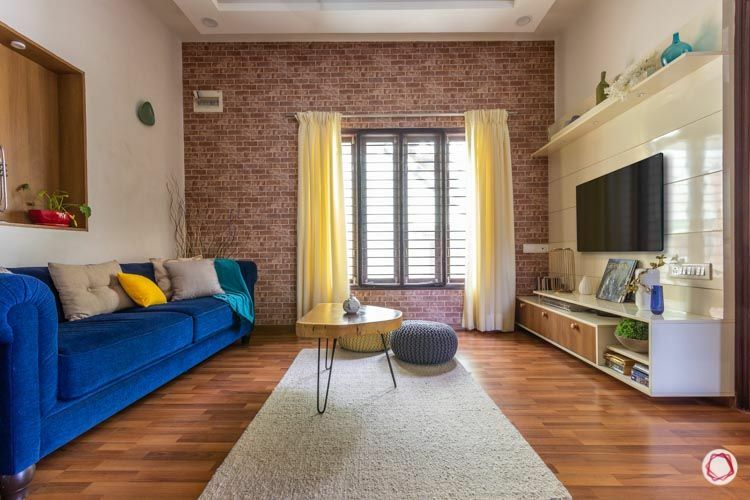 You will love the stylish update we gave this duplex house. Size of home: A duplex spanning 750 sq ft approx. 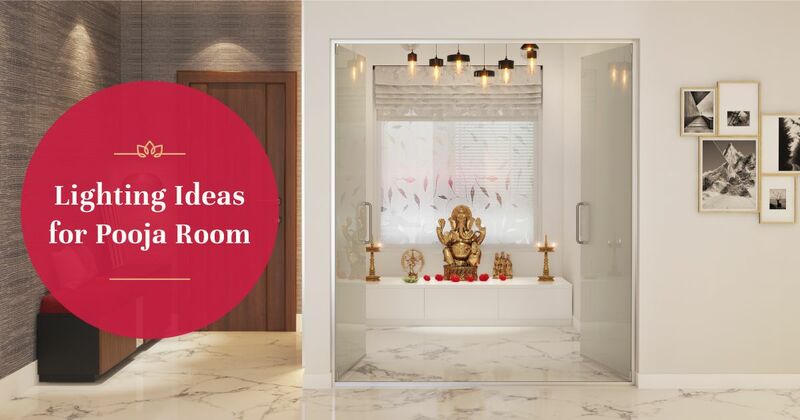 Having an extra all-purpose room at home is such a great idea, especially when you have creative minds residing there. 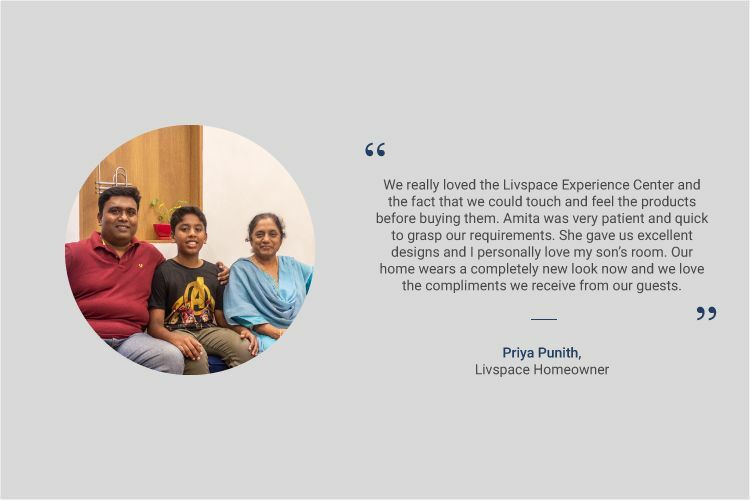 Diwakar and Priya Punith own this sprawling duplex house in Bengaluru and wanted to get the top floor renovated, when they approached Livspace. Overflowing with ideas and reference images, they met Amita Raikar, who was going to spearhead this one. 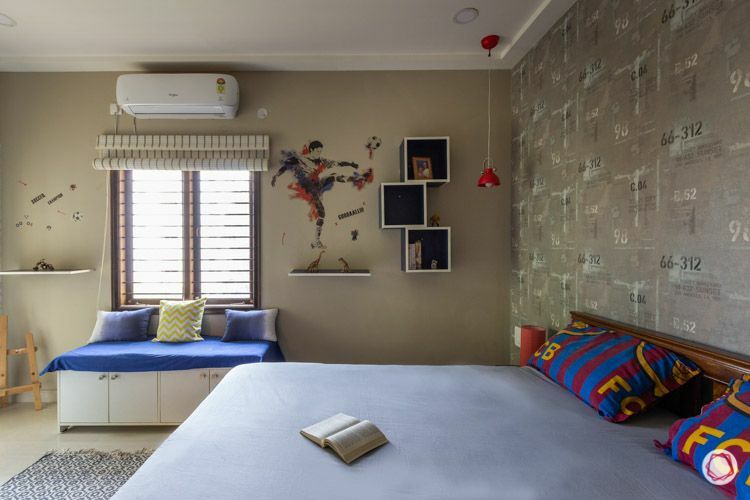 The top floor of this villa houses the kid’s room, along with the family and study rooms. 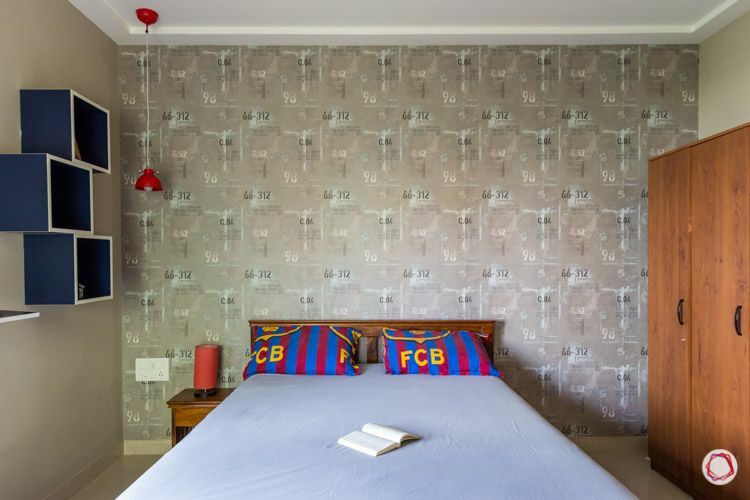 The idea was to fill the space with a lot of light and lively wallpapers. 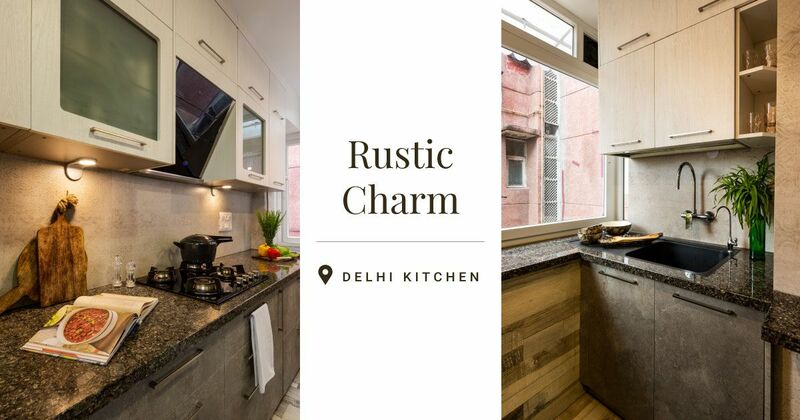 The result is a combination of vibrant colour and industrial elements that result in a trendy look for this home. 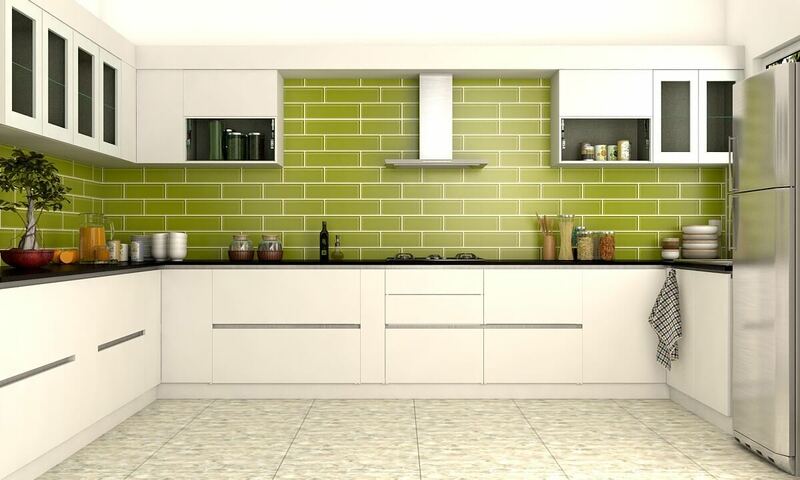 Take a tour to know how this excellent design unfolds.. 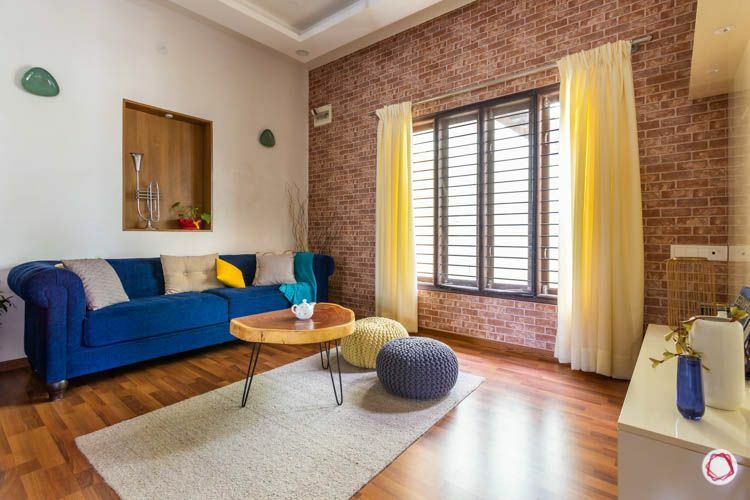 The first that you notice about the family room as soon as you enter is the industrial-feel exposed brick wall. This is something that the family really wanted, since they had seen this at the Experience Center. 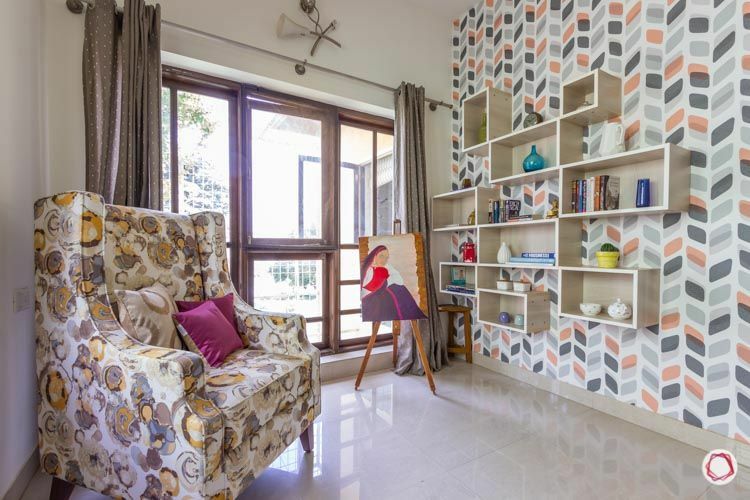 Amita, their designer loves to add a splash of colour in dull spaces and that is what she did here too. 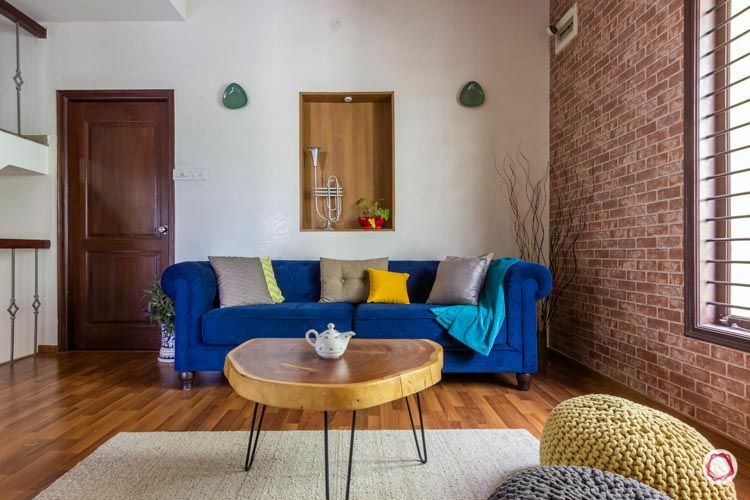 Therefore, a lovely indigo blue sofa takes centerstage in this family room. 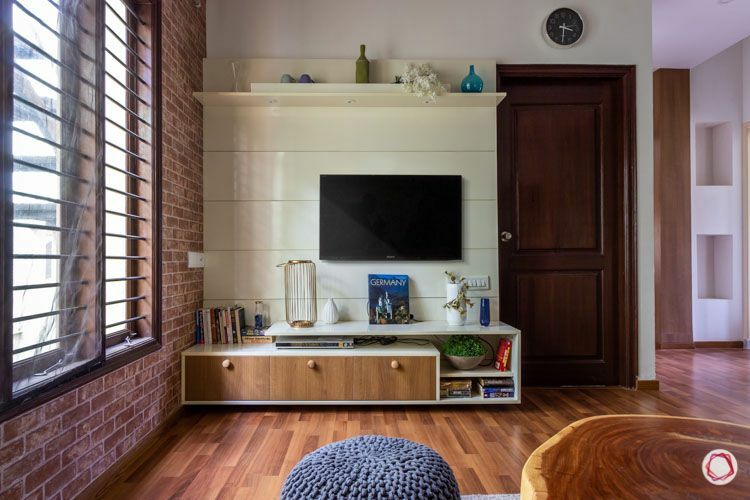 To keep things rustic and charming, she gave them wooden flooring and to maintain visual continuity, she gave a walnut finish laminate in the TV unit. Everything put together, this room has such a fresh vibe around it, we love it. 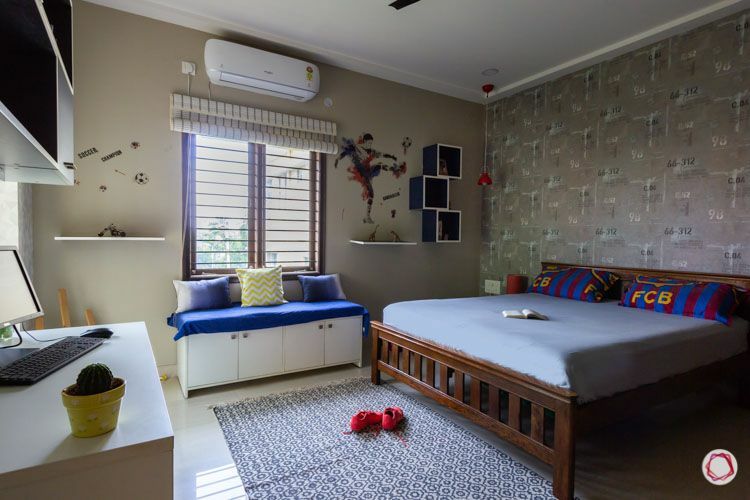 The kid’s room has so many things that you want to focus on. Let’s start with the colours and wallpapers used in here. 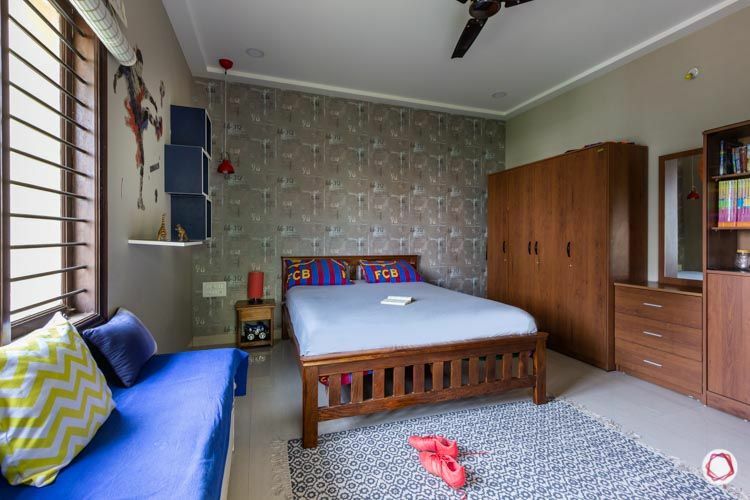 Both, Diwakar and Priya are very particular about wallpapers, thus Amita gave different versions behind the bed and the study table. 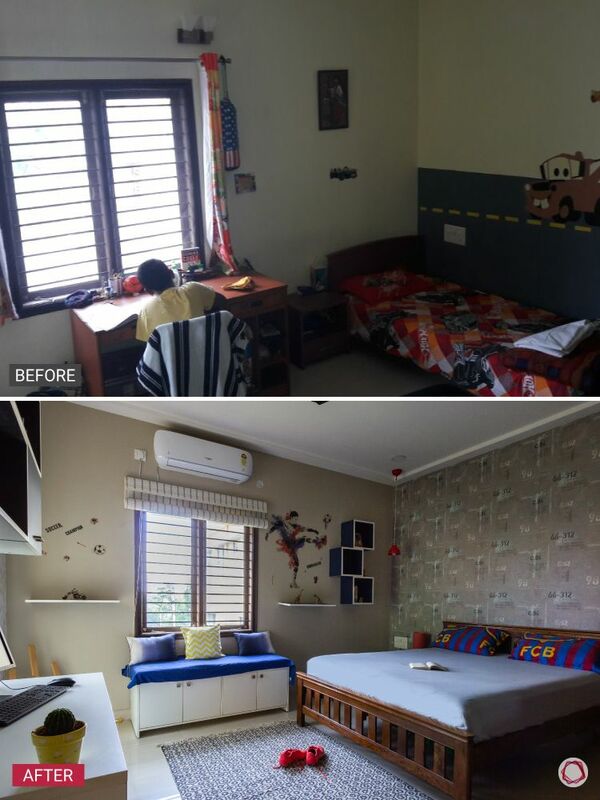 To decorate empty walls, she gave them wall shelves and ledges that hold his favourite miniatures and toys. 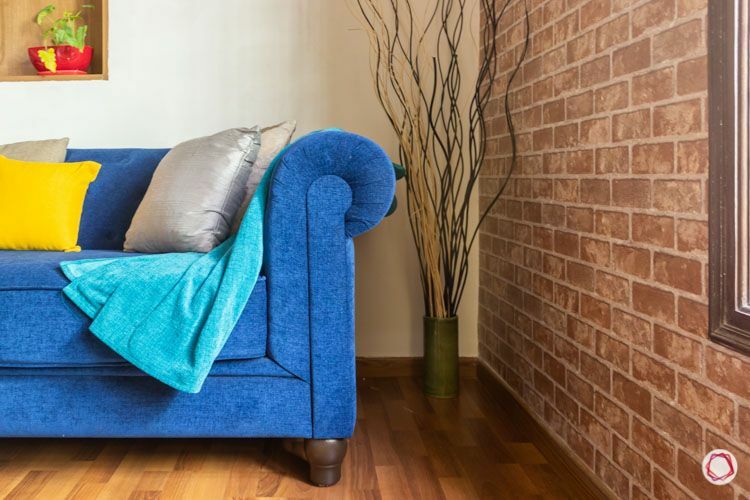 There’s always room for some extra seating when it comes to any room at home. Especially when it’s a kid’s room and your friends always come unannounced. 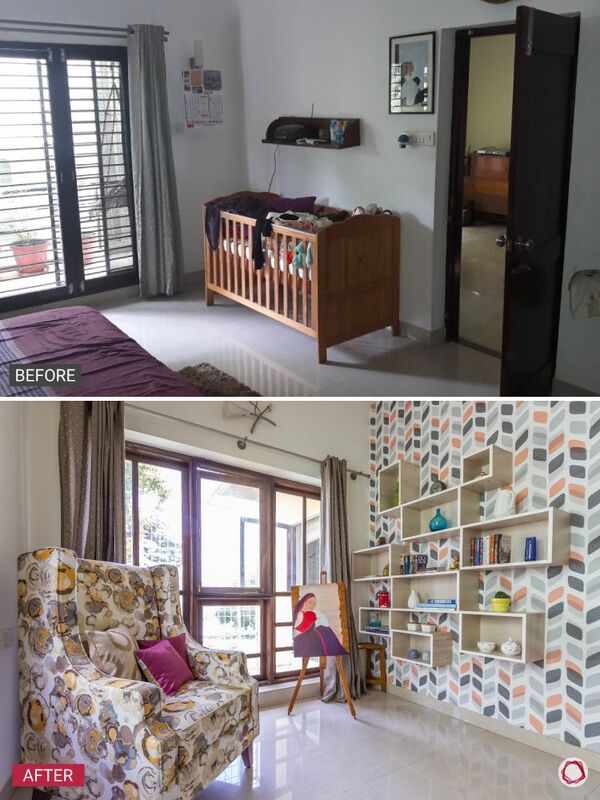 Thus, the space next to the window was converted into a functional seating zone with storage underneath. The study table is yet another smart addition for the basketball loving kid. 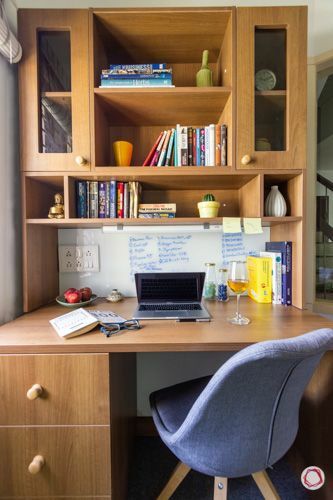 This study table features open and close shelves accompanied by drawers and complete with a white board for convenience. 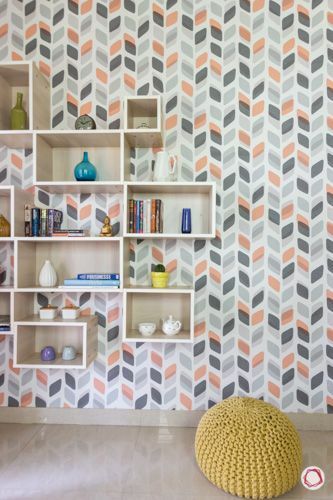 This room definitely packs a punch! 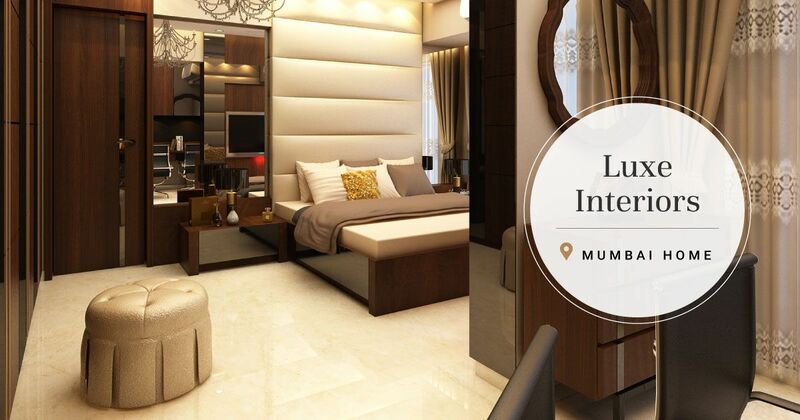 Isn’t it lovely to dedicate a room to leisure and hobbies? 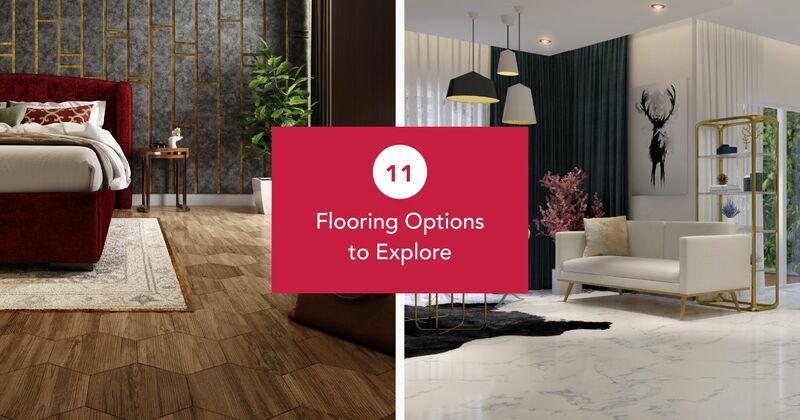 We love the idea of having a separate space for recreation. 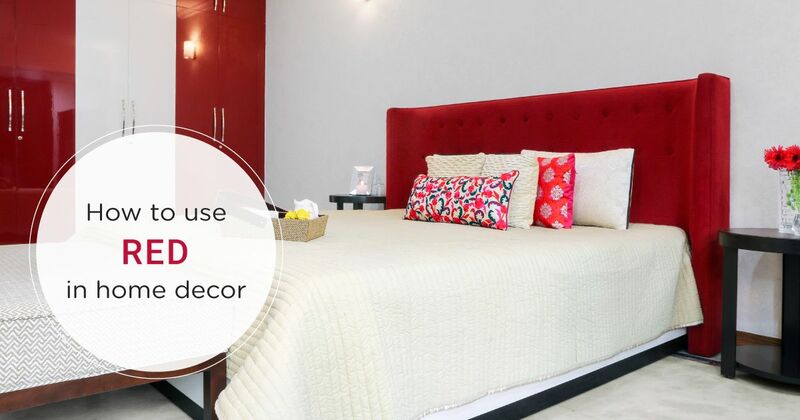 Priya loves painting and this room is her zone while she’s relaxing at home. 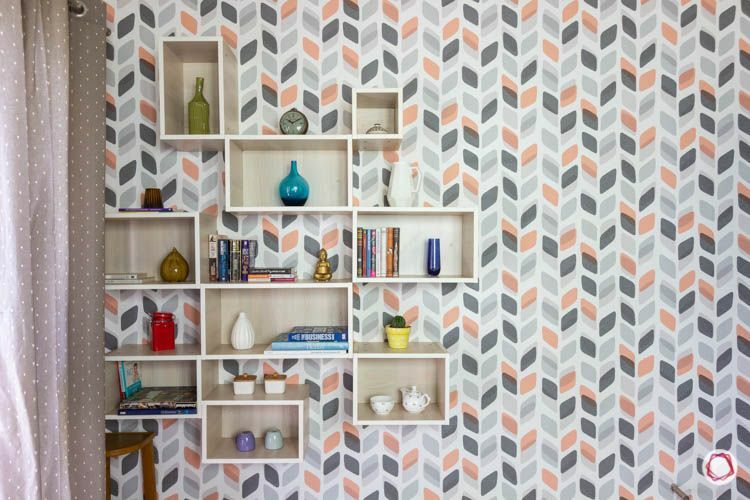 Once again, the wallpaper is the hero here, with a contemporary take on the classic leaf pattern. 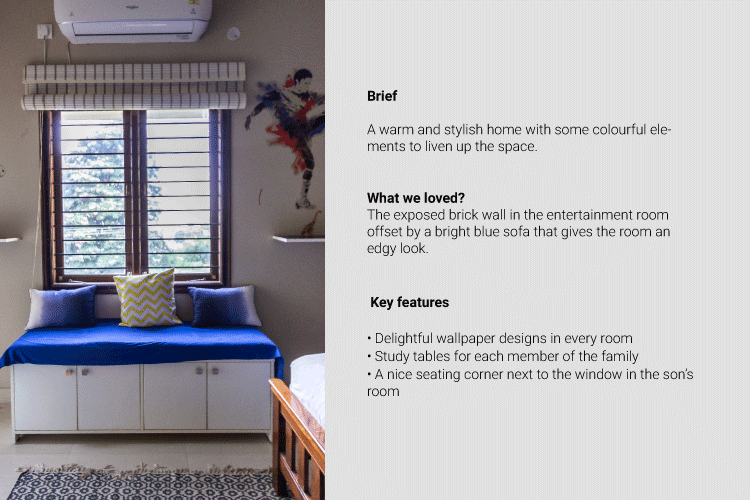 With a grid-style display shelf, the family can put all their curios, books and the like up on display. 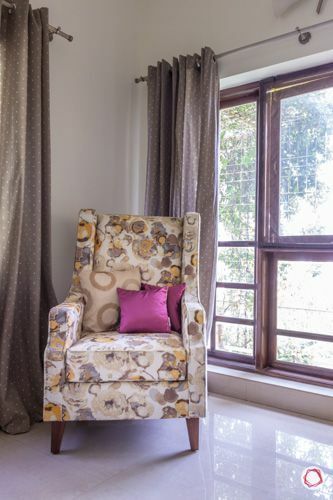 Do not miss the pretty printed accent chair where one can read, relax and unwind like a boss. 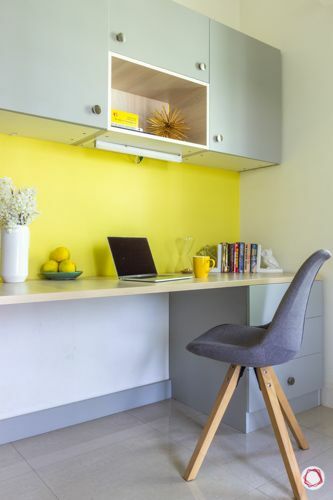 When you’re working from home, you definitely need your own space. 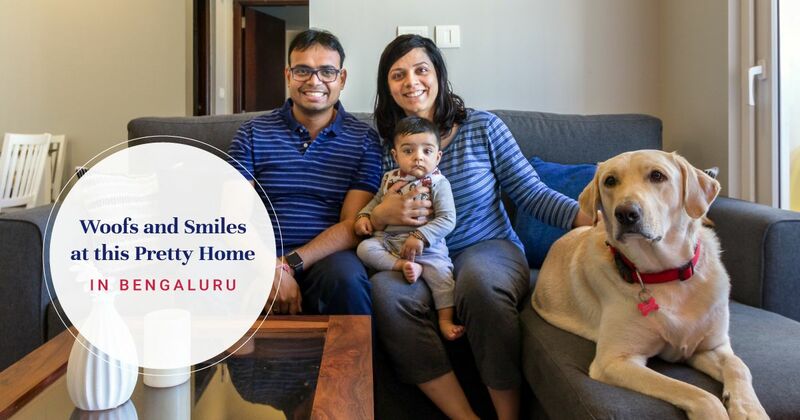 Diwakar and Priya have their own work zones at home. 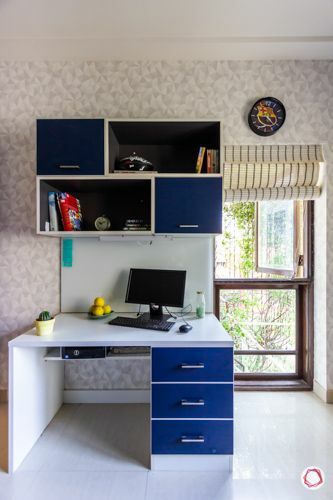 While Diwakar owns the muted, wooden study table with a lot of shelves for keeping his books, Priya has a more chirpy space to work in. 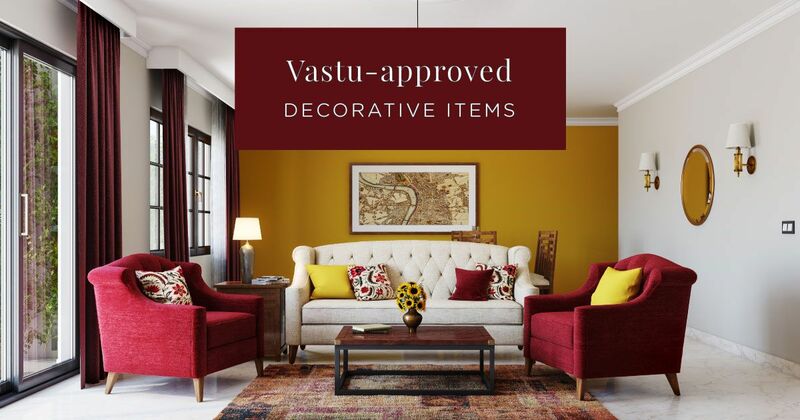 She can definitely kick away the blues with the bright yellow wall accompanied by the soothing blue colour palette. 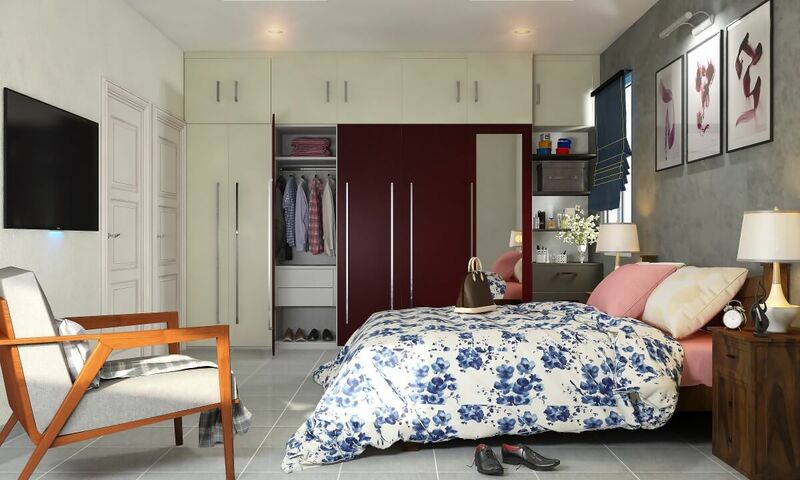 If you liked this design then we are sure this 4 BHK Gets Easy-to-Maintain Interiors on a Budget will interest you just as much.